This is the ‘home stretch’ of the current lunar cycle, and planets gathered in Scorpio are urging you to take the process deep. With a trine today between Venus in Scorpio and Nessus in Pisces, you might find particular support in addressing or resolving some matter of patterning in a relationship. Today’s Birthdays: Ninon de l’Enclos (1620-1705), Granville Sharp (1735-1813), Jacob Epstein (1880-1959), Zofia Nalkowska (1884-1954), Claude Rains (1889-1967), Johnny Marks (1909-1985), Louis le Brocquy (1916-2012), Richard Burton (1925-1984), Ennio Morricone (1928), James Hood (1942-2013), Tim Rice (1944), Glen Buxton (1947-1997), Ann Reinking (1949), Roland Emmerich (1955), Sinbad (1956), Deborah Cameron (1958), Neil Gaiman (1960), Hugh Bonneville (1963), Tracy Morgan (1968), Ellen Pompeo (1969), Warren G (1970), Walton Goggins (1971), Brittany Murphy (1977-2009), Eve (1978), Kiernan Shipka (1999). Danica Roem, center, is greeted by supporters as she prepares to give her victory speech on Tuesday. 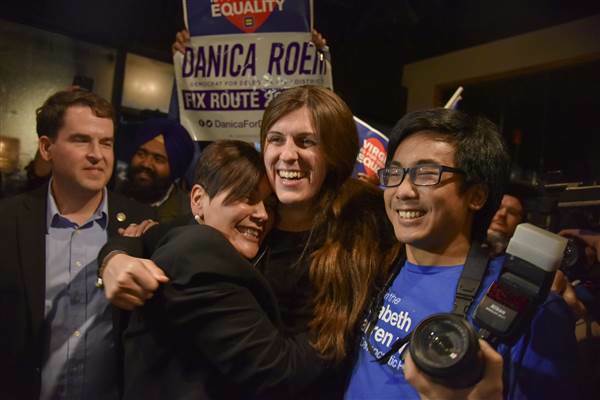 Roem is the first openly transgender state legislator to be seated in U.S. history. Although she discussed her gender identity, her core platform issues included jobs, schools and traffic congestion. Photo by Jahi Chikwendiu / The Washington Post. Democratic candidates for governor in both New Jersey and Virginia beat out their Republican rivals (remember Chris Christie? ), and Dems also won control of the Virginia General Assembly, in a direct backlash to the Trump Effect. And New York City’s progressive mayor, who’d campaigned for Bernie Sanders — Bill de Blasio — handily won a second term. Mainers defied the state’s bully of a governor to overwhelmingly approve expanding Medicare for low-income adults (of course, Gov. LePage now says he won’t enact the will of the people). And in Philadelphia, civil rights lawyer Larry Krasner — a longtime opponent of capital punishment who opposes police stop-and-frisk policies, and who has represented protesters with Black Lives Matter, ACT UP, Occupy Philadelphia and other progressive groups — has been elected District Attorney of the City of Brotherly Love. Moon Phase: Moon is in Disseminating (waning gibbous) phase and enters Last Quarter phase today at 12:36 pm PST / 3:36 pm EST (20:36:19 UTC). Moon Sign: Moon is in Leo and enters Virgo on Nov. 11 at 8:41 am PST / 11:41 am EST (16:41:14 UTC). — Sun conjunct Deucalion at 10:38 pm Nov. 9 PST / 1:38 am EST (06:38:04 UTC). — Vesta sextile Galactic Core at 4:14 am PST / 7:14 am EST (12:13:43 UTC), and Pholus at 12:41 pm PST / 3:41 pm EST (20:41:35 UTC). — Venus square Crantor at 2:03 pm PST / 5:03 pm EST (22:03:06 UTC). — Venus trine Nessus at 2:27 pm PST / 5:27 pm EST (22:27:19 UTC). Take the controls of your life and do whatever you can to guide yourself in the right direction. This will involve slowing down and making every decision consciously. Where you see no options, or ones you don’t like, it’s essential that you look carefully for other possible choices. This will not happen automatically, though powerful forces are guiding you. With today’s last quarter Moon, see if you can turn the corner on some project that peaked a week ago. This is the ‘home stretch’ of the current lunar cycle, and planets gathered in Scorpio are urging you to take the process deep. With a trine today between Venus in Scorpio and Nessus in Pisces, you might find particular support in addressing or resolving some matter of patterning in a relationship (especially a sexual relationship). Notice what feels like it’s old and could stand to be cut from your life to make way for better, healthier forms of relating.